It's no secret I love the designs of luxury fashion house Dolce & Gabbana. I've shared a few of my inspired looks like this one (I rocked last January on vacation in Colombia) as well as many of their images to serve as inspiration. 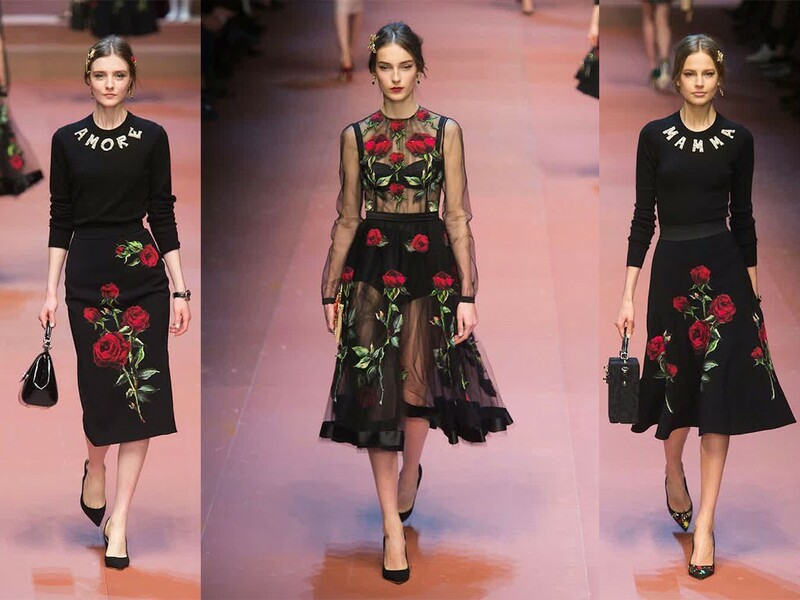 Dolce & Gabbana's designs are reminiscent of vintage-styles and silhouettes while being modern and playful. Bold patterns, mixed prints, heavy embellishments and ostentatious flair pervade their work and I appreciate all those aspects in fashion. My #stylesister Beyonce has also been spotted rocking their pieces with one of the most recent being a sweet mommy and daughter moment on Mother's day when the two wore Dolce's Hydrangea print dresses. Now with all that said, I cannot ignore the recent controversy around Melania Trump wearing their pieces. I shot this look out in Aruba in April and if you're not familiar, it's inspired by Dolce & Gabbana's 2015 & 2016 collection. I layered a black lace dress over my retro-inspired rose print swimsuit as a coverup, pulled my hair back with a middle part and secured a red rose to my low bun. I actually purchased this faux rose from a little marketplace in Cartagena last year and DIYed the flamenco-inspired hair accessory while there. I completed the look with winged eyeliner, red lips, crystal cross earrings, a wicker bucket basket, simple red heels and a beautiful vintage flamenco fan with Barcelona scenery on it. I picked it up at one of my favorite antique shops. You can get the look by clicking the links below and shopping the widget. Now back to Dolce and the topic of dressing Melania Trump. I was scrolling through IG one day and saw a post on D&G's account with Melania dressed in one of their ensembles. "Uh-oh" I said to myself and proceeded to click though to their main page. There were several posts of Lady Trump rocking their designs and I wasn't sure what to think of it. I was curious but also shrugged my shoulders. If I could depict my reaction in sound, it would be a hummm followed by a humph. I was curious and wondered if brands (beyond this specific one) should be accountable for upholding social & political beliefs. It's no secret Melania is wife to the current President of the USA and I can say that election announcement was not a celebratory one for me. I do not support Trump, his cabinet and their divisive rhetoric but I also don't have much of an opinion on Lady Trump except for the major side-eye I gave her after she more or less regurgitated First Lady Michelle Obama's speech. So what is Dolce saying by dressing Melania? Are they supporting Trump's politics by doing so? Is it some form of marketing strategy or are they simply excited to see the wife of the President wearing their designs? I'm not quite sure of the answer but I've read several articles and the general sentiment is they support Melania and do not care about the negative opinions of others and furthermore American politics. It seems a bit contradictory since Melania is tied to current American Politics but here I am rocking this look inspired by the designers. I even have a few pieces by them but does that mean I now somehow support Trump because they dress his wife? ISSA NO, so don't even fix your mind to thinking! Like many things in life, people (because people make brands) are allowed to share different opinions and disagree on issues including social and political ones. Does that make them enemies? I don't think so. I believe they can even have open conversations on the issues, once conducted in a respectful and constructive manner. Now I'm not certain that happened with D&G based on the comments from some followers and the designer. That may be a missed opportunity to spark healthy dialogue but that's a different story for another day. Now tell me what you think, do you believe brands should always be accountable for upholding social & political beliefs?